President Donald Trump accompanied by Senate Majority Leader Mitch McConnell of Ky., left, arrives for a Senate Republican policy lunch on Capitol Hill in Washington, March 26, 2019. U.S. President Donald Trump lashed out at the U.S. mainstream news media Tuesday, saying it was being condemned throughout the world for its wide coverage of what he called the "Russia Collusion Delusion." Barr, a Trump appointee as the country's top law enforcement official, and Deputy Attorney General Rod Rosenstein decided no obstruction charges were warranted against Trump. As Trump arrived at the Capitol for a luncheon meeting with Senate Republicans, he called the Mueller investigation "a ridiculous witch hunt, where it was proven very strongly, no collusion, no obstruction, no nothing." "I think what happened was a disgrace," the U.S. leader said of the probe. "I don't believe our country should allow this ever to happen again." But with the prosecutor clearing him of collusion allegations, Trump declared, "The Mueller report was great. It could not have been better." Meanwhile, Congressman Adam Schiff, chairman of the House Intelligence Committee, said top Democrats are considering what to do if Barr does not meet their demand to turn over the full Mueller report by next week. "We hope they'll comply," Schiff said "A four-page summary that may be colored by the attorney general's personal views is not adequate." 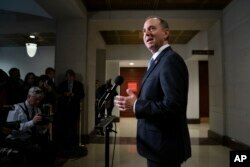 FILE - Rep. Adam Schiff, chairman of the House Intelligence Committee, talks to reporters at the Capitol in Washington, March 6, 2019. A Justice Department official said Tuesday it will take Barr "weeks, not months" to finish reviewing the Mueller report and release a version to the public. But what is unclear is whether Barr will write up another summary, or make the entire report public. House Judiciary Committee Chairman Jerrold Nadler has demanded Congress and the public see the entire report along with the evidence Mueller used to make his conclusions. "There are a lot of people out there that have done some very evil things, very bad things, I would say treasonous things against our country," Trump said Monday, without specifying anyone in particular. "Those people will certainly be looked at." Senator Lindsey Graham, a Trump ally and the head of the Senate Judiciary Committee, promised Monday to "unpack the other side of the story" of the Mueller investigation and to look into how the Justice Department started it. On Monday, Senate Minority Leader Chuck Schumer of New York urged a Senate vote on a resolution calling for the release of Mueller's full report. Majority Leader Mitch McConnell, a Kentucky Republican, objected, saying Barr must be given time to determine which portions of the report can be divulged without revealing classified information.